I’ve always wanted to try my hand at making flour tortillas from scratch. It’s quite surprising how few ingredients there are and how easy they are to make. It’s a little time consuming, but well worth the extra effort. Nice to know you can actually make homemade flour tortillas without having to run off to the store either! Here’s a step by step guide for you. Tortillas are a flatbread, or unleavened bread, meaning there’s no yeast. So there’s nothing to be afraid of, these are very easy. I used a combination of wheat and white flour. You can use all white flour if you prefer, just substitute exact amounts. A neighbor of mine ground the wheat flour herself and gave it to me, so this was the perfect opportunity for me to try it out. 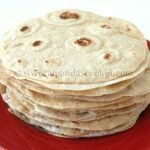 There are quite a few recipes out there for flour tortillas. The general consensus is that you will need flour, some water and a fat. Some add salt and either baking soda or powder. 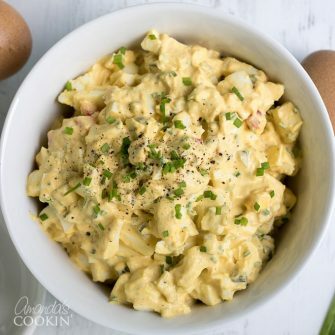 I developed mine by looking at probably 15 different recipes and combining all of these ingredients and lowering the fat content considerably. Many recipes include either lard or shortening, but then I read on several that vegetable oil can be substituted without a problem. I also ran across a couple that used considerably less oil and more water. So that’s what I did. Instead of moistening the dough with a lot of fat and some water, I used a lot of water and a small portion of fat. The results are great, perfect for wrapping around some tuna salad for lunch or warming it to have with tacos. Keep in mind though, lowering the fat also lowers the flavor since fat does add flavor to your final product. my oldest son commented last night when we had tacos “these are good but they have no flavor”. This coming from someone who is used to eating full-white flour store bought tortillas. So if you prefer, you can up the fat a little and lower the water, totally up to you. For us though, these are a great way to enjoy tacos and sandwiches with a lot less fat and a little more grain. Oh, one last note. When you get to the part where you roll the dough balls in your hand, follow my tip about running one of your hands under the faucet first. Get your hand wet, shake off the excess water, then roll the ball between your two palms. This adds just enough liquid to keep the dough moist which will result in an easy to roll out dough. Be sure to keep the dough covered so that it doesn’t dry out. Full printable recipe instructions are below. After forming the dough, divide it into 18 equal pieces. Roll each piece into a ball and place on cookie sheet, not touching each other, and cover with a towel. Remove one dough ball from under the towel and place on the floured counter. Press gently with your hand then use floured rolling pin to roll into a circle. Tortilla will be very thin. Repeat this process until cookie sheet has a single layer of tortillas (about three), then place another layer of foil on top and continue the process until all 18 tortillas are rolled out. Cook, one at a time, for about 30 seconds per side. After the first 15 seconds you will see bubbles begin to form. Place cooked tortillas on a foiled lined baking sheet in the same fashion as when you rolled them out. It's quite surprising how few ingredients there are and how easy they are to make. It's a little time consuming, but well worth the extra effort. Whisk the two flours, salt and baking powder together in a large shallow bowl. Add canola oil and 1 cup of the water and mix to form a dough. Add enough additional water until the dough comes together. Knead 10-15 times then let the dough rest, covered with a towel for five minutes. Divide the dough into 18 equal pieces. Run your hand under a running faucet and shake off the excess water. Wetting your hand will keep the dough moist as you roll. Roll each piece into a ball and place on cookie sheet, not touching each other, and cover with a towel. Allow dough to rest five minutes. Keep the dough balls covered with the towel as you work. Sprinkle counter with flour and keep rolling pin floured as well. Remove one dough ball from under the towel and place on the floured counter. Press gently with your hand then use floured rolling pin to roll into a circle. Roll dough, flip it, roll it, flip it, and roll again until circle is about 7-8? in diameter. Tortilla will be very thin. Place tortilla on foil lined cookie sheet. Preheat a large skillet over medium-high heat. Place tortilla in preheated pan and cook, one at a time, for about 30 seconds per side. Use tortillas immediately or allow them to cool completely, then store in a plastic zipper storage bag in the refrigerator for up to one week. To reheat, remove from zipper bag and place in a dry skillet over medium-high heat. Heat one side, then flip and heat the other, just enough to heat through. Thank you for a wonderful recipe- a huge success and a delightful dinner! Sounds like a great recipe..can you use 3 cups of whole wheat flour and 1 cup of white flour instead of 2 cups of each? Hi Tammy. I haven’t tried them that way but I am sure that you can! I grew up in New Mexico and my mom made everything from scratch. Friday nights was Mexican — enchiladas, tacos, etc. and we would just salivate when she made homemade tortillas. Making some this weekend with a big crock pot of beans. Will be making cornbread too — so I can mix it up during the week so I don’t have the same thing all week for lunch and dinner. Besides, love to awe and inspire my co-workers. Hi, I’m going to try this with gluten free flour and olive oil. Thanks for the recipe.